I recently began experimenting with aging beers in my basement. I heard from a few readers about the benefits of aging higher alcohol beers and how it could change the complexity and flavor of a brew. One of my favorite sites that I used to follow is: The Brew Basement (no longer active). That site had some great tips on how aging a beer can do wonders for it. I started to be a believer. Quite by accident, I ended up aging some Flying Dog Gonzo Imperial Porter for about a month or two and was really surprised at how in just 8-9 weeks the hops had mellowed and the alcohol bite had smoothed out a bit. That got me to thinking about aging some other beers. Last March I bought several bottles of North Coast's Old Rasputin Russian Imperial Stout. This beer had a 9% ABV and a 75 IBU rating. I opened and reviewed the first bottle immediately and ended up giving it a 3.7 out of 5 ranking. Not a bad ranking already, but I wondered what would happen to it if I aged it a bit. So, I packed away a couple bottles of this in a cool dark corner of my basement and forced myself not to touch them for a while. Four months later and I had the itch to try one of them again. I realized it had been only 4 months and beer of this kind could last at least a year or so if stored properly, but I broke one open for my birthday to celebrate. Good enough reason for me to open this up. This beer was stored on a bare cold cement basement floor in a dark corner where little to no light would hit it. I estimate the average temperature of the floor stayed around 65 degrees with very little variation. Not perfect conditions by any means but seeing how I didn't have a spare beer fridge with temperature control I had to do the next best thing. I put the beer in the fridge to chill it down just a bit and then opened it up. So how did it rate after 4 months? The beer poured with another impressive head. I could only pour 2/3rds of this beer into the pint glass before the head towered above the top of the glass. Exactly like last time! So at least the head was not affected. The aroma was rich with chocolate and coffee malts. It still smelled great. The taste was even better. In a matter of 4 months, much of the alcohol bite had mellowed yet you knew it was still a higher ABV brew. This beer was very smooth and still had a nice dry finish. The hops had toned down a bit as well. It tasted even better than I remembered. I read over my notes from March and couldn't help but think that this beer had improved. This time around I'm giving this beer a 4.0 out of 5 rating! I still have one more beer left from the original 4-pack and I plan to save it for the end of the year. Let's hope my craving for imperial stouts don't make me open this one up before then. The success of this short-term trial has encouraged me to try cellaring other strong beers for even longer periods of time. Have you had some beer aging successes? Post a comment and let us know what you found out. 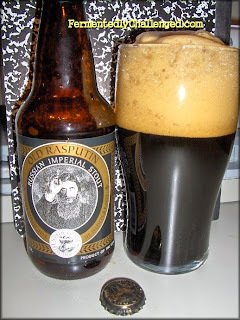 - Brew Review - Old Rasputin Russian Imperial Stout. - Revisiting Beers and Changing Tastes. - North Coast 2008 Old Stock Ale review.